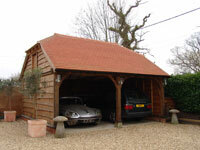 We specialise in high quality bespoke oak framed garages which are tailored to your exact requirements. 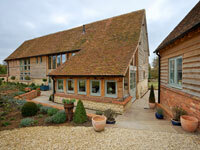 The traditional appeal of the oak framed open fronted ‘cart shed’ harks back to a simpler way of life. Our oak frame garages will not only enhance your everyday life both aesthetically and practically; they can add a considerable amount of value to your home. We offer a full range of designs and options; from simple two bay layouts to larger garage complexes providing accommodation at first floor level for uses such as a home office, gym, games room or annexe. We are always interested in designing oak framed structures, such as oak entrance porches, studios, cabins, summerhouses, garden rooms and retreats. 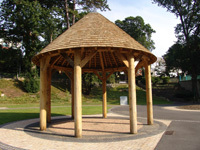 We can offer a full design & building service or alternatively supply an oak kit with detailed plans and instructions.